My Art Deco wall clock is 12" in diameter x 3/4" thick. It is covered with birdseye maple, wenge, padauk and walnut, all the natural colors of the wood. It is inspired by the art deco period which I believe to be one of the best ever. It comes with a high torque quartz movement and runs off a single battery. This is another of those attention getters for any room at home or at work. Each clock is made one at a time and takes about 2 weeks to complete. The hands come separated from the clock, but I provide instructions on mounting the hands. Also available in 18 and 24 inch size. 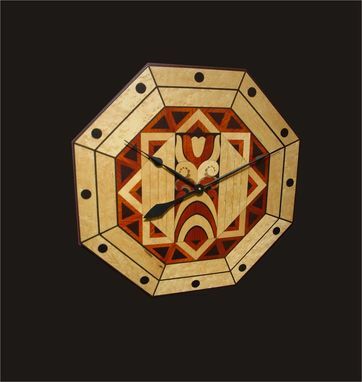 Art Deco Wall Clock. I am very happy with my clock. It is very striking, and appears as in the photograph. It was very well packed, and arrived sooner than I expected. My only criticism is that it should be described as "veneered" in the various types of woods, rather than "covered." Covered is somewhat ambiguous, and I thought the clock might be solid wood.